Forget about Urban Outfitters. 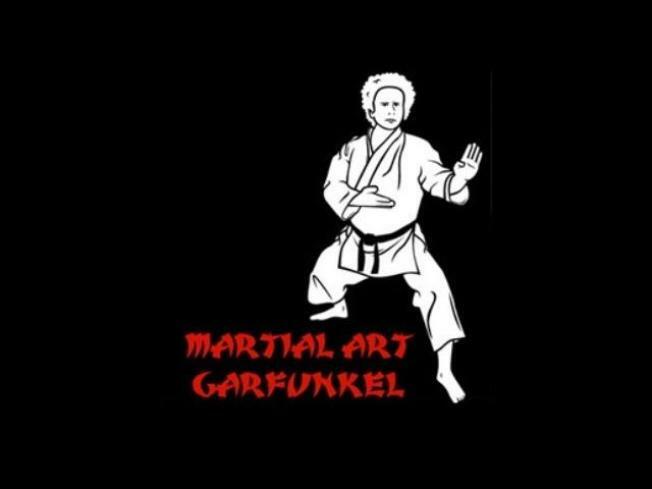 Super 7 has the best t-shirts in town, including the "Martial Art Garfunkel" shown here. It’s no secret that the economic crisis has made us more budget-conscious. We’re still reluctant to spend money on clothes and accessories, but certain things like t-shirts just need to be replaced when they look as if they’ve seen better days. Before you head down to one of the chain retailers to buy something that makes you look like everyone else, check out Super 7, a small boutique in Japantown, which sells the funkiest, most eye-catching T-shirts I have seen in a very long time. Super 7 was started seven years ago by Brian Flynn, a San Francisco artist who founded Hybrid Design, a design firm whose clients include Nike and Microsoft. Super 7 is an emporium of crazy, amazing things: posters; vintage and modern vinyl toys made in Japan (which have become collectors’ items); art books such as “Banksy’s Bristol, Home Sweet Home” and “Super7 Mook2”, a comprehensive guide to Japanese character toys; posters; and distinctive T-shirts. With all this creativity swirling around, it’s easy to see why Super 7’s T-shirts are so cool. My favorite women’s tees are Ganesha and Kali, designed by artist Sanjay Patel. For men’s tees, I like the Spaceships and the MPG. There is so much to choose from, so you’ll have to visit the store or the website to find what you like. Super 7. 1628 Post Street, San Francisco, CA 94115. (415) 409-4700. Esme Vos is the founder of www.shopplr.com.